Janet Kessler took this delightful photograph of a raccoon in Golden Gate Park for an exhibit at the main San Francisco library last summer. The following is her description of capturing these elusive animals on film . . .
“I had been invited to put on a photographic wildlife exhibit at the main library — what an honor! As I began preparing the photographs for the show, I realized that I really needed more animals — more animals that everyone would know about. For starters, I decided that I needed a shot of a raccoon. Raccoons normally come out after dark, so I roped my husband Jack into coming with me, because, also, I would be visiting unknown parts of the park. We had an early supper and headed out well before dark: me with my camera, and Jack with a powerful emergency flashlight which we bought years ago for, well, not exactly this kind of activity, but it was the best we had. I had no special nighttime photography equipment — the emergency flashlight would have to do. Jack also carried his brand new iPhone — it can do anything. We started walking in the park, not knowing anything at all about raccoons, just relying on hope. Jack wanted a little more guidance — he didn’t want to stay out all night, and we couldn’t decide on where to find raccoons. So, as we walked, he looked up “raccoon” on the internet. 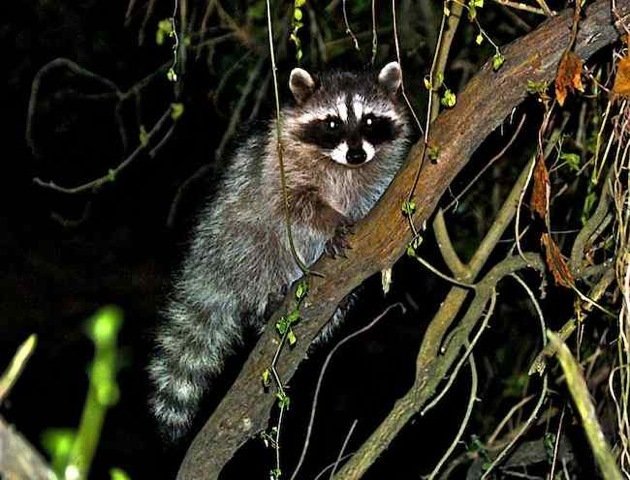 Of absolute relevance, but a complete surprise to us, was that raccoons live in trees. Come on, give me a break! We argued this, back and forth, but finally decided to “look up” as we walked — “just in case” — maybe we would see something. As it got darker, I eventually noticed a denser area up in one of the trees. I looked and looked, and decided, without really being able to see anything, that this might be a raccoon way up there, 75 feet above the ground. So, we settled down and waited — until Jack had had enough and said it was time to go. After all, there were unsavory fellas roaming around, too close for comfort, and they were even looking at us. He did not like it. But I felt safe with him, and decided we needed to stay a little longer — I think my enthusiasm and sense of adventure may have overpowered him. We decided to sprawl out on the ground at the base of the tree, to avoid neck-cramps. Here we enjoyed looking up into the tree branches — the way we all have when we were little. We had arrived in the park at 6:00pm, and now it was 10:00pm, when slowly we began to notice movement. Ahh, something was happening. 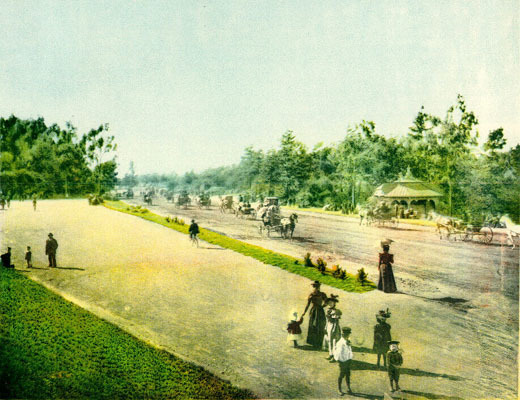 The movements occurred infrequently at first, but slowly, ever so slowly, there was more. And then, YES, we saw a raccoon tail — you could barely make out the stripes, but they were there! Yes, this would be my chance to take a raccoon photo. 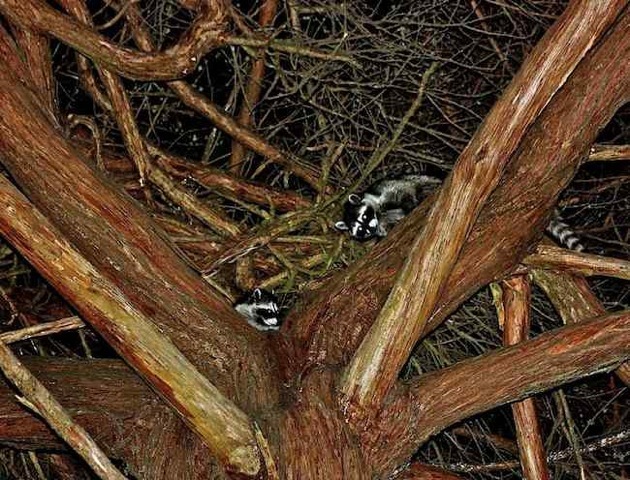 The raccoon was still high up in the tree, so we remained in our prone positions so as not to cause alarm. There was more movement. And then we noticed something very strange. That tail over there couldn’t possibly be connected to that raccoon, could it? 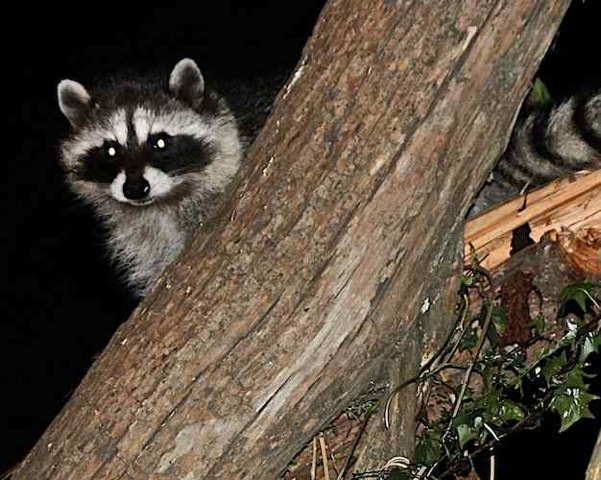 Noooo — there were two raccoons! We could feel our excitement mounting. The raccoons were still high up in the tree when, oh no, could it be? We now counted three of them!! It is at this time that we got up. My husband shined the light on the raccoons and I tried taking photos as they all slowly made their way down the tree trunk. A flashlight hardly produces enough light for taking photos, but we were able to get some fairly decent shots. After reaching the ground, the mom moved off, as did the larger of the cubs. But the smallest, the runt, actually turned around and came back to examine us from a high log on the ground. Hi there! The shutter of my camera kept getting stuck because of the lack of light, but we did get the photos I wanted, which I am including here. This entry was posted in people, wildlife and tagged golden gate park, urban parks, urban wildlife, wildlife photography. Bookmark the permalink. I am *so* delighted to see these charming photographs and read this delightful story from Janet Kessler. I am a great fan of her work. It’s not just the photography. She is the Jane Goodall of San Francisco’s coyotes, which she carefully observes and documents in her blog, Coyote Yipps. Followers of her blog get frequent short updates about a clan of coyotes she follows regularly, describing and photographing their behavior and relationships. Over time, one begins to understand these animals far better. Delightful adventure with raccoons in the park. We live with them, here in the midst of the small city of Ashland OR. A pair inhabits the space under our deck, and they come out after dusk to roam the neighborhood. In the spring fights are common and their cries are truly wild and eerie. There is a pile of poop in a corner of the garden – the communal toilet which I periodically rake into the soil as fertilizer. We find them rather considerate lodgers – only once have they pried open the trash can. It is somehow satisfying to have wild animals in one’s backyard.